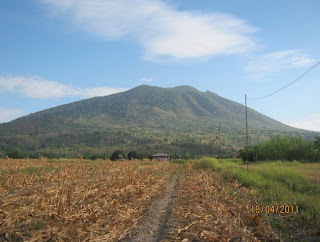 Mt ARAYAT (3385 fasl), is an inactive stratovolcano located between the towns of Arayat and Magalang in Pampanga. This goddess proudly presides over the vast plains of Central Luzon. 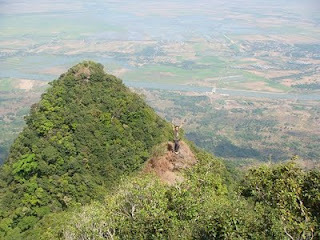 In Philippine folklore, Mt Arayat is known as the abode of the deity Sinukuan. 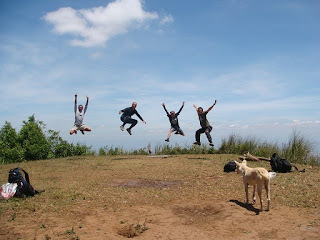 The locals of Magalang actually refer to Peak 2 as Sinukuan peak. The lower southern peak in Arayat is popularly referred to as Peak 1. Volcanic activity and erosion resulted in the formation of a collapsed crater that opens to the west-northwest direction. Landslides continue to change the appearance of the ridge (which is the upper lip of the crater). White Rock (an andesitic dome) is found in the amphitheater-like crater before you reach Sinukuan peak from Magalang. The Arayat side features the Pinnacle Peak which the locals of Arayat refer to as Torre! Between the Pinnacle Peak and Peak 1, there is another dome which is a favorite among climbers when taking pictures. The mountain has been closed a few times due to insurgency problems. Although it is more peaceful now, the friendly military personnel at Sinukuan Peak still don’t throw caution to the wind. They’ll have you log your names and numbers. They’ll check your packs and then they’ll run a little interview which often turns into a casual friendly chat depending on the nature of your answers. 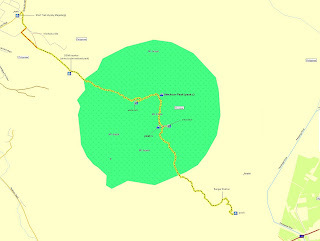 The Mt Arayat National Park Authority (forest ranger station) is located in San Juan Baño, Arayat, Pampanga. They most often require you to hire a guide and charge you entrance and optional camping fees. The rates may vary according to the mood of the park ranger and/or your diplomatic skills. The clear but ‘bouldery’ trail is a gradual ascent from the forest ranger station to Peak 1. This may take two to four hours depending on the load carried and the capability of the climber. There is no known water source except for the ranger station. There is a wide campsite at the peak which can accommodate twenty 2-person tents or more. This flat campsite is under the shade of rainforest trees. Follow the trail to the east and you’ll find the view deck that offers a breath-taking panorama of the vast plain of Central Luzon and the grand Pampanga River that snakes through it. 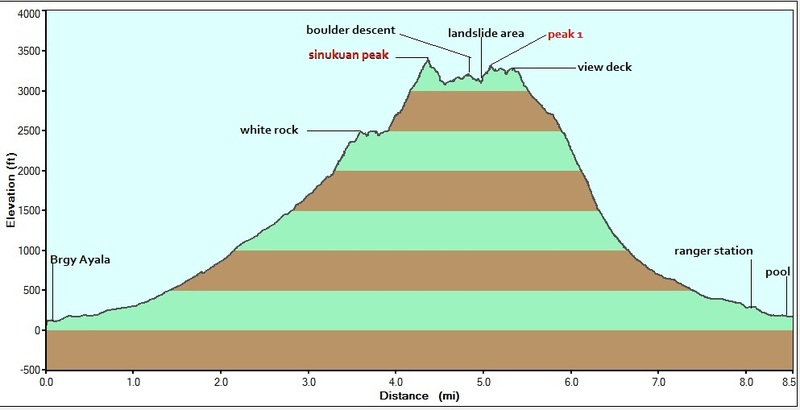 The trail to the west leads to the ridge which ends at the summit (Sinukuan Peak). Brgy. Ayala in Magalang, Pampanga is my preferred entry point. The people here are much nicer than the people in San Juan Baño which climbers have loved to call Brgy MagUlang as opposed to MagAlang on the other side of the mountain. You are just required to log your names at the Brgy Hall in Ayala and the army camp. No fees or guides required. From the Brgy Hall, you’ll follow a road that leads to the entry into the National Park. Ask the locals for directions. Half of the length of the road is concrete. This road is open and could exhaust you on a sunny day. We were lucky to have been able to hitch a ride from a local priest for half the length of the road. At the DENR marker, take the uphill trail that leads to the left. After about five minutes you’ll see the White Rock. Just head for that! Mostly ascents and no steep descents. There is only one clear trail. The only fork you’ll encounter is near the White Rock. The 100-meter trail to the right leads to the Rock while the trail to the left is the start of the steep ascent to the summit. At the summit, there is a tower manned by military personnel. This facility is solar-powered. The military personnel have set up huts outside the tower compound for their use but they let you have your meals and rests there! No campers are allowed in the fenced compound. The summit campsite can safely accommodate ten tents. Just don’t pitch your tents too close to the cliff. 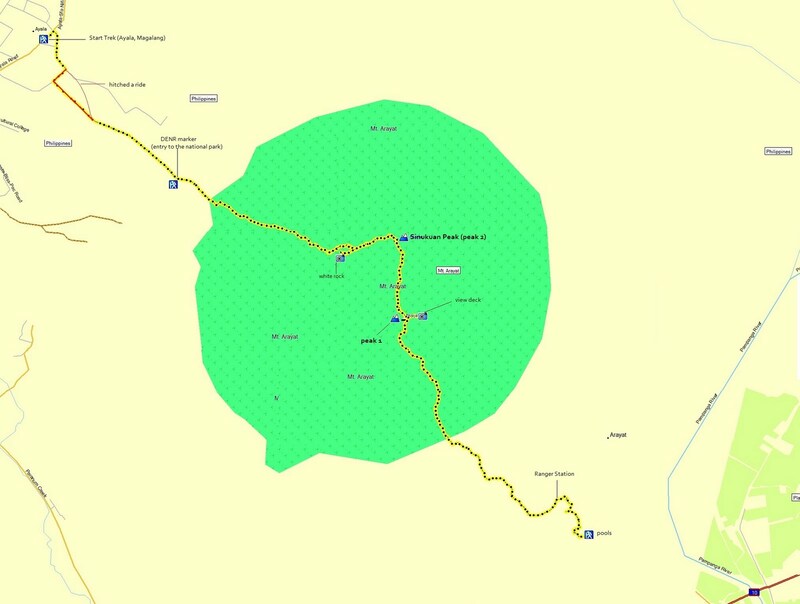 The trek from Brgy Ayala to the summit may take 3 to five hours and there is no known water source. Traverse climbs have become popular in Mt Arayat. Last Sunday (April 10), I guided four Facebook contacts through the more popular Brgy Ayala to San Juan Baño route. I first did this trek in 2009 as training for my G2 trek. Finding the trail, especially at the ridge, used to be tricky but since traverse treks started to gain popularity, the trail has become clearer except for the part where you’ll have to do a steep descent on the left (east) side of a boulder. I didn’t use this descent before but a group of climbers coming from Brgy San Juan Baño who happened to be there at that spot insisted that it was the right trail. I tried to navigate around the rock but what seemed to be a trail on the right side of the boulder only led to a perilous access to the continuation of the ridge (which was blocked by the boulder). So I followed the group’s advice. The mountain will always put the right sign at the right time if you mean no harm to her. That same group tied silvery blue ribbons throughout the rest of our journey so it became much easier to recognize the trail. The white doggie from the military facility also accompanied us up to that boulder. She wanted to come with us but she was too scared to go down the steep way beside the boulder. She reluctantly went with the other group back to the summit where she came from. I really wanted to keep the dog. After the steep descent, you’ll have to negotiate with the loose soil up an eroded wall. This ‘landslide’ part is the toughest challenge you’ll have to face in a traverse trek in Mt Arayat. You should know how to recognize reliable handholds and footholds on this steep fifty-meter ascent or else it could cost you your life! After this, the trail becomes really easy until you reach Peak 1. The continuation of the trail leads to the south off the campsite at Peak 1. The trail to the east leads to the view deck as previously mentioned. The descent to the park ranger station may take one and a half hours of running and hopping. When you’ve reached the ranger station, you’ll be asked to log in. In case they ask for a registration fee, P30 is OK. Two years ago, I had to lie that we had already paid at Magalang. Last Sunday, the ranger station counted my group as part of the Sabiterz Tribe who climbed via San Juan Baño that day. We caught up with them near the ranger station. Two hundred meters after the ranger station, you’ll come to a public resort with a couple of swimming pools. You may wash up here. Around five pm, there are fewer ‘extortionists’ left there. The trade-off: around that time too, the bathrooms close and the water supply start to get shut off. The last trip from Arayat, Pampanga is around 5pm. It’s good to catch this trip. Y’see the two bus companies are in tight competition. They have brought down the fare (A/C bus) from around P100 two years ago to a little more than P50 now. If you miss the last trip you’ll have to take the bus at San Fernando. In my two Magalang-Magulang traverse treks, I was able to dodge the fees at DENR Ranger Station in San Juan Baño. Be cautious in asking for directions there. Every answer has a price tag in this place! When you ask for directions don’t let them accompany you. Do it verbally. People who INSIST in accompanying or helping you always think of your monetary value. Shove them off politely by constantly saying ‘Tenk you po! OK na po!’ When you’re looking for a bathroom to bathe in, don’t let them guide you to some seats. Seats have corresponding prices there. Just insist that you are looking for THE bathrooms and not just a jet of water coming out of a tube stuck to a wall! The bathrooms have some ledges where you can put your stuff and sit on free of charge. Beyond 5 pm, these bathrooms are closed but if you know how to do ‘diplomacy’, they’ll open them for you. They charge just P5 per person. AVOID the STOUT WOMAN with a big mouth. She is one of the authorized guides and assistants in the resort. She will insist her services on you but just politely get rid of her. @ mam kelsa...uu nga e...sayang yung roots! bad trip...parang cambodia yung effect nun e...hindi ko alam kung gawa yun ng DENR para bigyan ng mas convenient na trail yung mga pumapanhik (weirdong pag-iisip)...or mga furniture business people...ginawa atang sabitan ng payong yung roots! nakakadismaya talaga! sir/mam.. nice blog.. tanong lng po.. from pasay pwd na bumaba sa SM pampanga tpos jeep to magalang? mgkno na kya rates ng bus & jeep ngyn? salamat po..
Hello. Good and informative trip report, but it would be nice if you could share your GPX-files so other hikers can import them on their GPS devices. Thanks for the input. I do share my gpx files upon request. It's just that blogger.com does not have the file-sharing widget so I can't post those gpx files up. Ser! Wala po kayong kontak na guide sa Arayat? Wala po mam e. Pasensya na.